The OOI is a large infrastructure project designed to be in operation for 25 years; that is long enough for a researcher to spend almost their entire career engaging with the OOI. 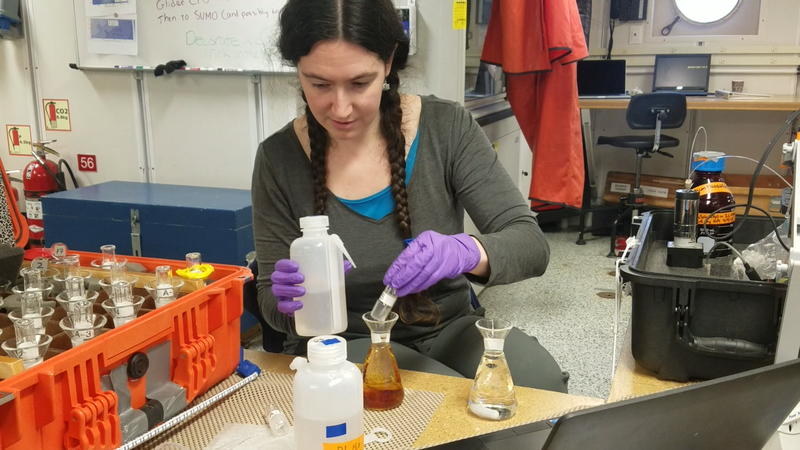 Because of these new opportunities, students and early career scientists are diving in to the OOI as early adopters of the system and gaining their foothold for the long haul. 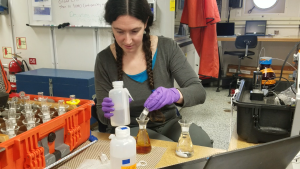 This summer, the OOI Communications Team will be highlighting some of these scientists and the work they are doing with the OOI, like Dr. Hilary Palevsky, a Postdoctoral Scholar at the Woods Hole Oceanographic Institution studying carbon sequestration in the Irminger Sea. Having grown up in western Pennsylvania, Palevsky did not foresee becoming an oceanographer. During her junior year at Amherst College, Palevsky had her first opportunity to test her sea legs. 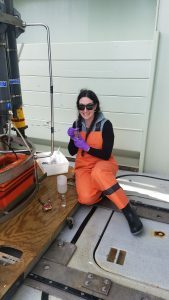 After spending a semester at the Williams-Mystic Maritime Studies Program, including ten days aboard the SSV Corwith Cramer tall ship, she was hooked and began her path to pursue a career in oceanography. Within a few years, Palevsky crossed the country and began work on a PhD in Chemical Oceanography at the University of Washington. Her PhD work focused on the role of sinking organic matter in carbon sequestration (i.e. the Biological Pump). Historically, the contributions of biology to ocean carbon cycling/carbon sequestration have been more intensely studied in the warmer growing season summer months. However, studies have shown that winter might contribute a missing key piece of this sinking organic matter-carbon sequestration puzzle. Palevsky’s work focused on container ship transects in the north Pacific Ocean where she found that deep winter ventilation reduced the amount of carbon sequestered in the deep ocean by sinking organic matter. 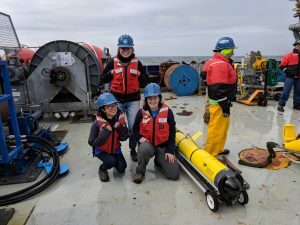 However, Palevsky only had access to surface measurements, which left her with lingering questions about the connections between winter ventilation and carbon cycling in the deep ocean. The OOI provided Palevsky with the missing piece. “The OOI was the only opportunity out there to get that kind of data – winter data and depth profiles,” says Palevsky. 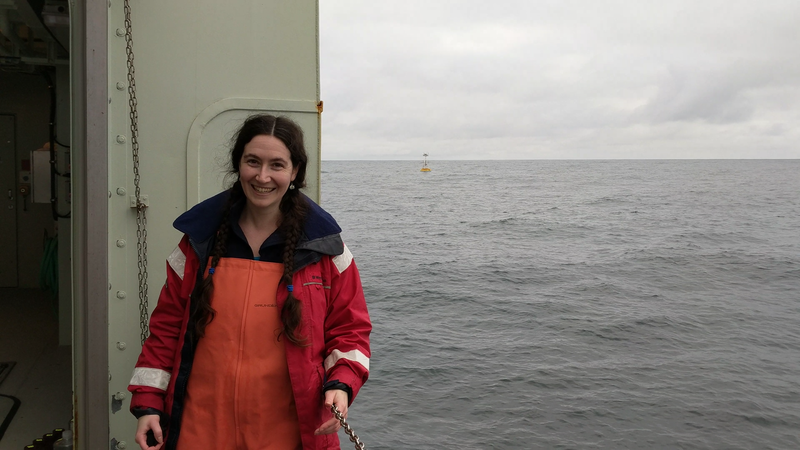 So once again Palevsky crossed the country, this time heading to Woods Hole Oceanographic Institution for her Postdoctoral Scholarship. Some of Palevsky’s initial analyses can be found in her article in the OOI Special Issue of Oceanography Magazine. In terms of what is next for Palevsky, she will be staying on the East Coast taking on the position of Lecturer at Wellesley College in Massachusetts. 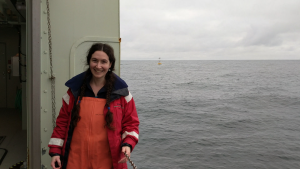 For her next OOI adventure, she describes examining mesoscale variability within the Irminger Sea Array and long-term trends and variability in these processes. For her part in the oceanographic community, Palevsky is committed to supporting the next generation of ocean scientists, and took two undergraduate students on the OOI Irminger Sea cruise. You can check out their blog here. Perhaps this will be their SSV Corwith Cramer moment.